292 pages | 74 B/W Illus. The international nature of the sport industry presents many management challenges and opportunities for sport organisations. This book brings together cutting-edge research from leading sport management scholars around the world, surveying a wide range of topics and issues facing the sport industry today. It represents an essential platform for the international exchange of ideas, best practice and research in sport management studies. The globalisation of the sport industry has brought increased complexity to organisations’ operations in terms of regulation, competition and multiculturalism. Drawing on a wealth of original research from fifteen countries, this book addresses a variety of global, regional, national and community issues that are central to successful sport management. Combining both qualitative and quantitative studies, it explores key themes, such as managing resources and organisational change, marketing and promotion, law and regulation, sport-for-development and research protocols. 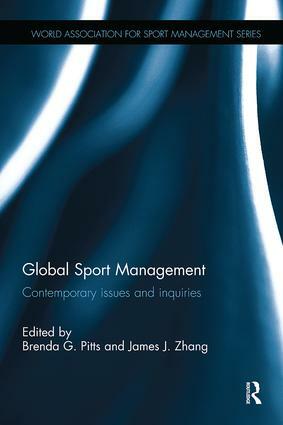 Global Sport Management Studies: Contemporary issues and inquiriesis essential reading for all students and scholars of sport management, sport business and sport marketing, as well as for any professional working in the sport and leisure industries. 9. Why Do Women choose to Work in the Management of Professional Baseball? Brenda G. Pitts is Professor of Sport Management and Director of the Sport Business Research Laboratory at Georgia State University, in Atlanta, Georgia, USA. James J. Zhang is Professor and Director of the International Center for Sport Management (ICSM) at the University of Georgia, in Athens, Georgia, USA. The World Association for Sport Management (WASM) was founded to facilitate sport management research, teaching and learning excellence, and professional practice, across every continent. The WASM book series is designed to support those aims by presenting current research and scholarship, from well-established and emerging scholars and practitioners, on sport management theory, policy and practice. Books in the series will explore contemporary issues and key challenges in sport management, and identify important new directions for research and professional practice. Above all, the series aims to encourage and highlight the development of international perspectives, international partnerships, and international best practice in sport management, recognizing the globalised nature of the contemporary sport industry.